Stop me if this sounds familiar. You buy a new computer, it's blazing fast and you have no issues with it. Fast forward a few years. It now takes forever to turn on. When it finally boots to the Operating System, you have to wait 5 more minutes for before you can actually use it. Programs take way too long to open. Web browsing is painfully slow. Searching for a file is a good time to take a lunch break. Why does this happen and how can you fix it? There are a lot of factors here, so let’s break down some of the possibilities one by one. This is a problem we see multiple times a week. A traditional hard drive has spinning platters and an arm that moves back and forth to access the data. Hard Drives can fail for a variety of reasons. Physical Shock, Dust, Static, Power Surges, and since they are constantly in motion, just physical wear and tear over time. We have even seen hard drives already failing only a few months after the computer was purchased. Hard Drives fail in multiple ways. They can be working fine on Monday and be completely dead on Tuesday. They can gradually fail, which will result in a slower computer because everything the machine does relies on the hard drive accessing data on the drive. If your computer has started getting slower and slower, it’s a good idea to bring your machine by so we can backup your data and run diagnostics on the drive. Once it completely fails, recovering your data becomes a gamble we don’t want you to take. We suggest upgrading to a Solid State Drive. This is a type of storage drive that has no moving parts. This makes it MUCH faster, but also much more reliable since it is much less likely to fail. While we can replace the hard drive with another traditional hard drive, we don’t generally recommend it. This is another very common reason for a slow computer. In fact, any computer that is used routinely will eventually fall victim to this. Every time you download a file, install or uninstall a program, or just use your computer, your machine is creating temporary files, shortcuts, log files, registry entries and more. These “junk” files add up over time, and will cause your computer to get slower and slower. The more a computer is used, the faster this happens. The more junk you have, the longer it will take the computer to find a file or open a program. Imagine trying to find a book in a clean and organized bookshelf versus looking through a mountain of them. We can run a tune up to clear out most of this Junk. Your computer has less to sift through and will run faster. The best option here, however, is to completely reinstall your Operating System. We back up all of your data, completely format the drive, reinstall the Operating System and then transfer your data back. This will get the computer as close as possible to how it ran when you first took it out of the box. I do this once every 6 months on my personal machines to keep them running as fast as possible. The only downside is that this takes a bit longer than a Tune Up, but in my opinion, is worth the wait. Most of our customers don’t take the computer out of the box and use it “as is” for the life of the machine. A few do, and their computers will run at about the same speed the entire time. The reason for this is they aren’t installing dozens of programs, updating them, uninstalling them, etc. The more programs you have installed, the more junk files are created. Most programs have something that runs on the machine as soon as you start it. This causes that frustrating wait when you first turn the computer on. Some programs take up more system resources than others. Many Antivirus programs, for instance, can cause an incredible amount of slowness. You have your internet browser open with 5 or 6 tabs open. You then open Word to work on a document, but you need to reference something in Excel. You need to print something from Quickbooks. Meanwhile you are playing audio and Carbonite is backing everything up and your Antivirus is scanning all of this. Oh and Windows would like to install an update. This isn’t an uncommon or abusive way to use a computer. But every computer will handle all of this differently depending on what hardware is inside of it. Uninstalling your programs isn’t usually a realistic solution here, so what’s the answer? A Tune Up or an Operating System Reinstall will sometimes help here depending on the number of programs and how they are being used. Getting it back to “like new” is often a solution. In some cases though, a customer might be trying to run a few too many programs for the hardware inside their machine to handle. Even fresh out of the box the computer would struggle with that load. In these situations we would recommend upgrading to a Solid State Drive and/or upgrading the memory in the computer to increase the baseline speed of the machine. Upgrading the memory of a machine is a surprisingly cheap and fast upgrade, so it’s a good place to start. In the most extreme cases, we would recommend a new computer if we think your current one just isn’t up to the tasks you are asking of it. We have built many custom desktops for customers wanting to run a specific, resource hog, programs or multi-task without any slowdown. Viruses and Malware are sometimes very obvious. You will get ad pop ups, scare tactic messages about a problem on the machine and other very flashy symptoms. Most of the time, however, they are designed to NOT be noticed. They want to run silently in the background. These types could be stealing your information, tracking your keystrokes, or even using your computers hardware to power crypto-mining at another location. These types of malware will have a much more noticeable effect on the speed of your machine as they run constantly in the background. While slowing down your computer is the most immediate and annoying consequence, your data being at risk is a much more serious long term problem, so if you suspect you might have a virus, getting it taken care of needs to be a priority. The solution here is a Virus Removal, or in severe cases, Reinstalling the Operating System to wipe out any trace of the infections. Many of our customers day to day usage of their computer has mostly moved online. Many things that used to be programs have moved to web based interfaces. A lot of calls we get about a “slow computer” are in fact, just a slow experience when using an internet browser. There is an easy way to determine whether your computer’s slowness is the actual computer, or just web based. If your online work is slow, try opening a program like Word, Quickbooks or Adobe that doesn’t rely on your internet. Browse through your files and open some pictures and documents. If all of these opened quickly, it’s likely just your internet that is slow. A tune up, hardware upgrade or operating system reinstall might make your machine faster, but you could see the same slowness when you try to log back into your bank’s website. Some of this can be solved by clearing out your web browser’s history. It, like your operating system, accumulates junk files that can slow it down. We will also check for extensions that might be slowing down the browser. From there we will run a speed test to determine if you are actually getting the speeds you are paying for from your internet provider. Occasionally we will encounter a scenario where we highly recommend upgrading your internet speeds. An example, a customer of ours ran an office with a dozen people who were all using Dropbox (which is constantly using internet bandwidth). They were only paying for 5Mbps through their Internet Provider. This was not nearly enough to power everything they needed. Paying for a better speed from their Internet Provider solved their issues. This issue could also be caused by a poor Wi-Fi signal to your computer, which is a topic I could write another entire article on. Give us a call if you have a less than ideal internet experience and we can come to you and test all the different facets of your internet connection to determine where the slowdown is occurring. There are many, many other reasons your computer might be running slow. The Operating System you have installed may be too new for the older hardware on the machine. Dust build up can overheat things and make them work harder causing things to slow down. Sometimes we solve “slowness” by replacing a bad wireless mouse and keyboard or a video cable adapter. If your machine isn’t running fast enough for you, give us a call or come by. Whatever the cause is, we can help you find a solution. Windows 7 “End of Support” or “End of Life” Date is January 14th, 2020. What exactly does this mean? What should you do? If you are using a PC with Windows 7, we highly recommend you upgrade to Windows 10 or replace the computer. Give us a call at 806 722 0770 or swing it by the shop and we can help you determine which option is the best investment of your time and money. We expect to be covered up in this type of work later in the year, so the sooner we can get you away from Windows 7, the better. If all of your machines are Windows 8.1, Windows 10 or Macs, you don’t need to worry about this. But please help us spread the word and share this with your friends, family and co-workers that still use Windows 7. You may recall this same process happening with Windows XP several years ago. No more security updates. This creates an environment that is increasingly dangerous to use as time passes. While an Operating System is still supported, Microsoft has a large team of people that look for security holes, and then release an update to patch that hole. This ends for Windows 7 on January 14, 2020. So any security holes that other people discover, will stay wide open. This opens up people still using it to major security risks. No more bug fixes. Occasionally a program, piece of hardware or driver will cause an issue with Windows that will result in failed updates, blue screens, etc. Fixes for these are releases in Windows Updates. Once End of Life hits, these end. Windows 7 will become more and more unstable over time. First, don’t panic, the actual End of Life date is around the corner, but we have time. We wanted to make sure all of our customers have plenty of time to make a plan for moving away from Windows 7. It’s also worth noting that while Microsoft will end support for Windows 7, that doesn’t mean we will be doing the same. If for whatever reason, you still have Windows 7 next year, we are still here to help you. Do be aware that as time goes on, some things may not be “fixable” and will be an inevitable result of the Operating System not being supported. More on that below. End of Life creates a snowball effect. On January 14, 2020, you will still be able to turn your computer on, check your email, use Word, play your games, etc. It probably won’t be dangerous (yet) and you will be able to do most everything else you could on January 13th. The only immediate change is that Internet Explorer in Windows 7 has the same End of Life date, so it may not work and you will need to use a different Web Browser (Chrome, Firefox). Things will get worse from there. As I mentioned above, it will be increasingly dangerous as time goes on and security exploits are found by the bad guys. Your personal data will be more and more at risk the longer you use it. Eventually, software developers will also stop supporting Windows 7. This means the same things will occur for the programs you use. No security updates, no bug fixes. Dangerous and Unstable. Some programs will out right stop working. Taking a look at the End of Life process for XP gives us a good idea of what to expect with 7. In XP, some Antivirus programs won’t work, you can’t install some programs, the ones you can are more likely to be glitchy and unsafe. The good news is that you have plenty of options. The bad news is that it’s a lot of options. The best place to start is calling us or coming by and we can recommend a plan going forward for your specific situation. To be clear, we do not recommend this. We strongly don’t recommend this. However, it is an option and I wanted to get it out of the way. We still have customers that use XP, and a few that even have machines running Windows 98. Most of these are very specific cases where some important proprietary software won’t run on newer Operating Systems and the machines aren’t connected to the internet. Most Windows 7 machines will run Windows 10 just fine. There are some that have trouble with Windows 10 without also upgrading memory or other components. We can tell you if your machine is worth upgrading or not. Upgrading involves backing up your data, formatting the hard drive, installing Windows 10 and then transferring your data back to the machine. Pros: Cheaper than replacing the machine. You keep the machine you are used to. Cons: This process can take several days. Cost: $149 - $199 depending on if you have data you need transferred. Almost every laptop or desktop you can buy in 2019 will have Windows 10 pre-installed. You bring us the old and new machines and we will transfer all of your files to the new one. Pros: You get a new computer. Cons: More expensive than upgrading. Will still have to transfer data from old to new machines in most cases. We can build you a custom PC to meet your specific needs. All of our custom builds come with Windows 10. We can build anything from a small black PC for your office all the way to a unique red and black themed machine with lights for your home. Pros: Custom built to your needs. You won’t pay for internal components that you won’t need or utilize. Cons: More expensive than upgrading. Will have to transfer data from old machine to new one. We can’t custom build laptops, so this is for desktops only. Cost: Around $800-$1500 depending on your needs. Macs are good machines, but be aware that they also have Operating Systems that are unsupported eventually, so you won’t entirely avoid this process with them. (Although upgrading to a new Mac OS is much easier). My general advice for people wondering if they should switch to a Mac is this; Do you feel like learning an entirely different type of Operating System? If you are up for that adventure, go ahead. If not, stick with Windows. Pros: Macs last a long time if properly treated. Upgrading to a new Mac OS is generally easy. Cons: Macs aren’t cheap. You will have to re-purchase all of the programs you use. Some may not work. Transferring Data is a bit more difficult. Cost: New Mac Cost + $99 Data Migration. This is not something I think any of our customers will do, but just in case I want you to know it is an option. You can pay Microsoft to extend Windows 7 Support on your machine(s). They haven’t been up front with the pricing, so I expect it isn’t cheap. This option is more designed more for large companies that have a fleet of Windows 7 machines, or have software that won’t run on Windows 10 yet. Our 24/7 Plan includes a lot of perks. But for this particular situation there are two specific items that I wanted to bring up. All In-Shop Repair Labor is covered under the plan. This includes the labor cost of upgrading to Windows 10 and/or the cost of transferring data from an old machine to a new one. You get Unlimited Remote Support from our local staff included in the plan. If you are using Windows 7, and move to Windows 10, we are a phone call away and can remote into your computer to help you with the learning curve whenever problems or questions pop-up. For more information on our 24/7 Maintenance Plan, click here. If you are already on our 24/7 Maintenance Plan, good news! Upgrading to Windows 10 won’t cost you anything extra! Just give us a call to get started. We are here to answer any questions you may have about Windows 7, Windows 10 or any other technology issues you need assistance with. Give us a call or come by to get started! Welcome to our Annual Holiday Gift Guide! This is our largest gift guide ever! Each of our Geeks has picked 3 unique gifts, so you should definitely be able to find the perfect gift for the “hard to buy for” person in your life. If you see something you are interested in, just click on the image and you will be taken to the Amazon page for that product. At the bottom of the guide you will also find a link to all of our gift guide recommendations from all of our previous years! If you are still having trouble, give us a call or come by and we will be happy to give you more gift ideas. We have all had one of those nights where we forget to plug in our phone, and wake up to a phone that will be dead before lunch. With wireless charging becoming more readily available, why not invest in this amazing Mouse pad/Wireless phone charger combo! You can easily charge your phone while keeping it close at hand. Are you trying to be more active and want to monitor your steps and vitals, but you don’t want to spend $100 on a fitbit? The Letscom Fitness Tracker is the perfect, cheap alternative to a traditional fitbit smart watch/band. It allows you to track your steps for the day, as well as create daily goals. It also has a heart rate monitor and it’s waterproof! A fun Pixel art creation and alarm clock that will make waking up fun and unique. It has 30 preset and professional sleep-aid and smart alarms with audio and visual support. It also has a Built in FM tuner, temperature sensor and social media notifications. Are you prepared for another cold winter? Neither are we! But now we have an option to make winter a little easier with the Milwaukee Heated ToughShell Jacket. The jacket is insulated with heating elements that are battery powered and gives you the ability to regulate temperature with a remote control. Great gift for the friends and loved ones that are constantly working outside. I’ve tried dozens of “to do” and productivity apps. The biggest problem is once the app is closed, it’s out of sight, out of mind. I needed a physical planner. The Panda Planner has skyrocketed my productivity. It includes daily, weekly and monthly planners. The big difference here is daily entries for “Things I’m looking forward to/grateful for/need to do better”. It’s more than just a To Do List, in that it helps me stay focused on the “Why”. Have you ever set down your freshly poured hot coffee, or a cup of sweet ice tea and you start working on something just to come back to a cup of cold coffee or warm tea? Well that's a thing of the past with this YETI Mug with double-wall vacuum insulation keeping the hot things hot and the cold things cold. One of the leading causes of carpal tunnel syndrome in the wrists is constant computer use. A lot of the time however, we have to use our computers daily, whether it be for work, hobby, etc. Fortunately, one of the things that can help with this is a mousepad that has a wrist support. The NEX Mousepad not only has wrist support, but also comes with a pad for the keyboard! These earbuds are truly wireless and you can use one or 2 buds at a time depending on what you’re doing. These earbuds are also completely waterproof so if you want to take a shower and listen to music you have that capability. The charging case it comes with also has the ability to charge your phone as well so if you have your headphones with you, you don't have to worry about your phone running out of juice. Tired of constantly seeing your children on the television, computer or mobile devices? At this point in time we rely heavily on technology, but why not take a break? With the Star Wars Lego First Order Destroyer set you can have a fun project to complete with your children. Lego sets can be a little challenging but in the end you will have bonded with your children on completing a fun model! If you have smart phones, tablets, kindles, wireless earbuds or anything that needs a charge, you need power. This Portable Charger is a lifesaver for me during long travels. It can charge most phones over 6 times on one charge! It has multiple ports so you can charge several devices at one time. Say Goodbye to having to send that “Phone is about to die..” text message. Staring at a computer screen or a phone screen can cause eye fatigue and headaches. But with these Computer Glasses you can filter out the harmful high energy blue light that is emitted by electronic screens. Allowing you to focus on the task at hand while protecting your eyes. Desktop computers have a lot of cables. Mouse, keyboard, speakers, and other peripherals can create a lot of confusing clutter. 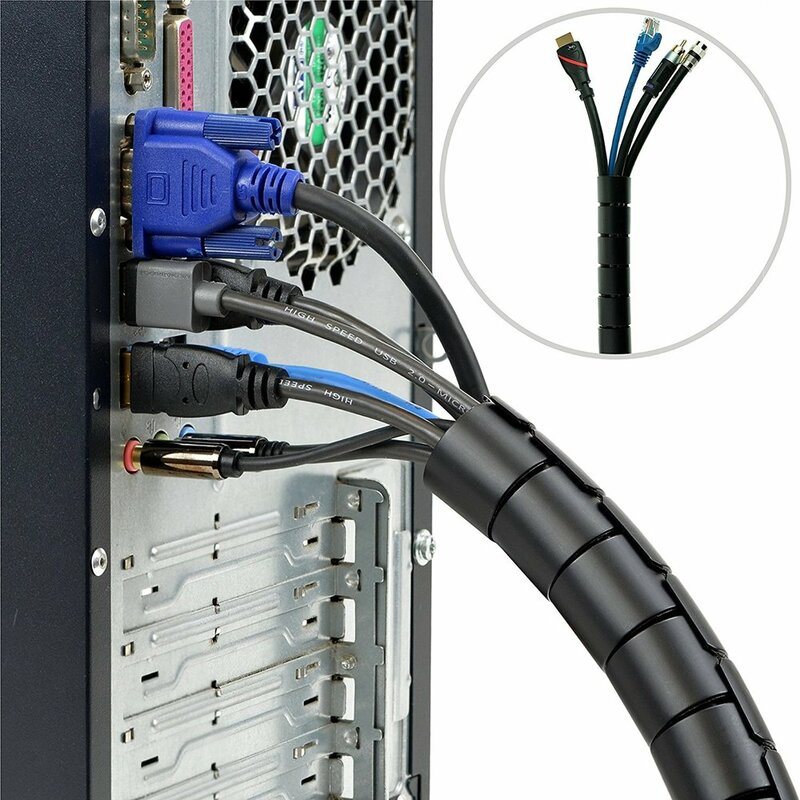 Thankfully, the Mediabridge EZ Cable Bundler allows for a simple cable management solution. Turn that mess of 5-10 cables into one big, easy to manage cord bundle! If you are looking for a lower price full HD indoor smart home camera look no further the Waze smart camera. It features motion and sound tracking and provides clear images up to 30 feet even during nighttime. It also works with Alexa so you can ask Alexa to show your front door, kid's room or anywhere else you have your Waze Cam. We all know a wine connoisseur that may or may not be part of our family. A great gag gift idea for that special person is a wine glass that turns your bottle of wine into your wine glass! With this you can aerate, pour and drink IN ONE EASY STEP! Just attach the glass to the wine bottle and you are ready to go! One of my favorite ways to “unplug” is with a good card or board game. Century Spice Road is one of my favorites. It’s a very relaxing, calm game where you trade “spices” for points with up to 5 of your family or friends. This is perfect for the holiday season, and a great way to get your family members to put their phones down and actually interact with each other. And I’m always up for playing a board game, so let me know if you want to try it out! Curious what our gift guide contained in previous years? Click the image to the right to see all 56 items that we have recommended in all of our Holiday Gift Guides! You can also, of course, give the gift of SuperGeeks! You can purchase someone a year of our 24/7 Maintenance Plan so we can provide them with unlimited remote support, in shop labor, tune ups and much more. 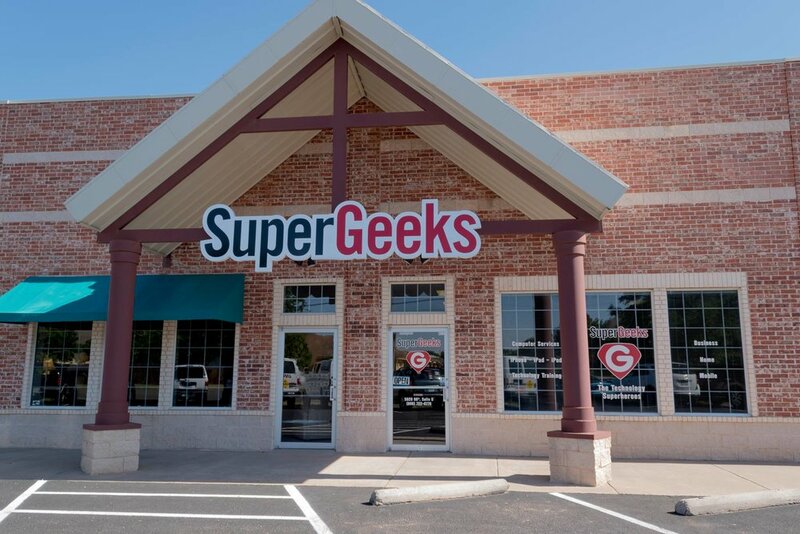 If someone you know is getting a new device, buy them a SuperGeeks Gift Certificate so we can help set it up or sit down with them for 1 on 1 Training. If someone you know is always complaining about their WiFi coverage, buy them a gift certificate for us to come out and install Google WiFi! Give us a call or come by if you have any questions or want to pick up a Gift Certificate! Many of our on-site service calls deal with poor WiFi Coverage. When we arrive, we generally find one router, usually, a low-quality one provided by the internet service provider. The WiFi signal from this device doesn't reach a back bedroom, office or into a basement. This creates frustrating dead spots. A WiFi range extender can be added, but depending on the model this may involve you having to switch networks depending on where you are in your home or office. Not ideal. Google WiFi can help solve this problem. CNET called Google WiFi “The best Wi-Fi system on the market.” Let’s take a look at why. Google WiFi replaces your existing router, and additional Google WiFi points are placed throughout your home or office to provide a single mesh network that can help eliminate dead spots. When you move through your home or office, your device is automatically switched to the Google WiFi point with the strongest signal. The number of Google WiFi points you will need will depend on the size of your home or office. While One Wifi Point will cover a small 500-1500 square foot space, it is recommended to have at least two for maximum coverage. Have a larger space? This system supports up to SIX Google WiFi points! Google WiFi also has an extremely useful app. You can prioritize a device to get the fastest speed, so you can stream Netflix without worrying about other devices on your network slowing it down. You can also easily share your WiFi password with guests, limit internet access to specific devices for homework or bedtime, and much more! If you are ready to experience Google WiFi first hand, give us a call or come by to get started! We will help determine how many WiFi Points you need, set them up in your home or office for peak efficiency and show you how to use all the features on the app. Part of our diagnostic process includes testing the hard drive in your machine. 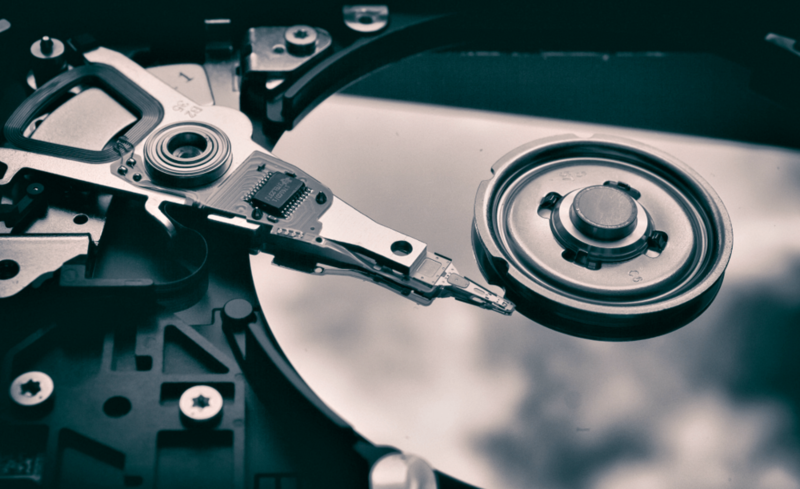 We see failing hard drives several times per week. Our recommendation is normally to replace the failing hard drive with a solid state drive. Likewise, if you are in the market for a new computer, we recommend you specifically look for a machine with a solid state drive. What is a solid state drive? Why are we recommending it? To get a better idea of what a solid state drive is, we need to take a look at a traditional hard drive first. A traditional hard drive, above, consists of small metal “platters” that contain the data and a mechanical arm that moves back and forth to read that data. These platters hold all of the data that your computer uses. The operating system, programs, documents, pictures are all stored here. When a hard drive dies, all of this is at risk of being permanently lost. When the computer is in use, the platters spin at speeds of 5400 to 7200 rotations per minute. Fast. The arm then moves back and forth to access the data you need. If this sounds familiar, this is the same basic premise as a record player. This has several problems and limitations. Moving Parts: Anything mechanical that moves is going to fail at some point. Speed: The drive can only ever access data as fast as the mechanics can move. When you are waiting for the computer to boot up, the speed of the hard drive accessing information plays a role in that. Movement: Just like a record player, if you move or bump the computer while it is on, it could “skip” and kill the drive. These are all contributing factors in why we see so many failing hard drives in the shop. Some of these drives are in the process of failing, where we can still recover data. Some of them require us to ship them to a data recovery clean room. And some of them are a lost cause. Now let’s take a look at a Solid State Drive. A Solid State Drive has no moving parts. While this is similar technology to a USB Flash Drive, this technology is much better and offers a lot of benefits over a traditional Hard Drive. Since there are no moving parts, they are much, much faster. The drive doesn’t have to wait on a platter to spin and a mechanical arm to find the data. Opening files, programs and saving changes takes much less time. If you have a hard drive in your machine, it can take a LONG time to boot up. And when it finally loads into your Operating System, you still have to wait for everything to finish loading before you can actually use it. With a Solid State Drive, your computer can boot AND be completely ready to use in under 30 seconds. The biggest benefit of having no moving parts, is lifespan. The drive won’t be affected by drops and bumps, and won’t mechanically wear down over time. We have only seen 1 failing Solid State Drive. Ever. And it was like that out of the box. Personally, I will never own another computer with a traditional hard drive in it. I highly recommend you do the same. When you are in the market for a new computer, make sure this is something you look for. We can also upgrade your current computer to a solid state drive. Whether it is a Mac or a PC, replacing a Hard Drive with a Solid State Drive can add years to the lifespan of a machine and make it much faster! Give us a call or come by to get started or if you have any questions. "My employee just let a Microsoft technician into our computer with all of our client records." We get calls like this multiple times a day. First things first, none of these are legitimate. They are all scams. If you ever get a pop up, error message, phone call or email saying that you need to call a number for computer support, it is people trying to scam you out of hundreds of dollars. They will say they are from Microsoft, Dell, Apple and every other name people recognize. They will tell you they are the only ones that can fix it. Every single one of these is a scam. Please tell your friends, family, co-workers and employees or forward this to them. We see too many people in our community taken advantage of with these tactics when some education could put a stop to it. Now to the topic at hand. Ads. A lot of these scam attempts come from ads being clicked while using the internet. I want to go over how to recognize an ad on a few different websites that commonly cause this issue. Advertisements aren’t inherently evil. Ads on the internet are extremely similar to ads in a newspaper or magazine. Someone buys ad space, and their message is displayed. This is how many, many local and larger businesses grow and sustain themselves. As well as how websites make money to continue operating. Some ads, however, can be malicious. Anyone can buy an ad on Google, Facebook, Yahoo, etc. And that ad can lead you literally anywhere on the internet. Just because it’s a picture of a celebrity with a gossipy title, doesn’t mean that’s what you will be clicking through to. Sometimes these scams come from searching for something like “Microsoft Support” and clicking on ad that might LOOK like official support, but will lead you to calling a scammer. Other times you can click on a completely unrelated ad for “Discount Jeans!” and you will get a pop up yelling at you about a virus on your computer. Just because it isn't computer related doesn't make it safer. Here’s the good news. Ads are always listed as such, you just have to look closely. Let’s take a look at what ads look like on several different sites. This is Yahoo Sports. As you scroll down you will see articles. The "Sponsored" tag above the "article" lets us know that this is an advertisement. This is content that someone has paid to display on this page. It could be a completely legitimate online game, or link you to a scam. Game ads are a huge market for these scams. It's a risky click. Let's go to Facebook now. As you scroll through your feed, you will see content from friends, family and businesses you have liked or followed. You will also see quite a few ads. Again, this is how Facebook and nearly any free website makes money. On Facebook, like Yahoo, we will be looking for the term "Sponsored" to spot ads. It will sometimes also say "Suggested Content". This is paid content that is appearing in your feed. Ads are also quite common on the right sidebar on Facebook. Remember, plenty of ads are just businesses trying to sell a product or reach new customers. If you know the company, it's more likely that it's safe (although by no means a guarantee as we will see later). If there is any doubt about its legitimacy, it's not worth clicking on. This ad is for "Brooklinen" a company I know is legitimate. If I happened to be in the market for sheets, I would feel reasonably comfortable clicking this. Facebook is where a LOT of our calls about scam pop ups come from. Proceed very cautiously. Let's take a look at a Google search now. Hard to make out, I know. But I wanted the entire web page shown here to start. I searched for "Microsoft Tech Support". I have 5 results on the screen. A whole lot more if I scroll down. Let's take a look at that top search result. I won't post all of them, but all FOUR of the top results are not the official Microsoft Support page. All of them are ads that took me to very suspicious looking websites. Pop quiz time, which one of the following will take us to a real Microsoft support page? Top or Bottom? If your answer was the top, you are now on the phone with a scammer who is requesting access to your computer. If you said bottom, you are probably on a very long hold with Microsoft Official Support. The top result says "Ad" next to it. And the URL, while it has "microsoft" in it, is still not right. Look for whatever comes before the .com in a web address, as this is the owner of this website. In this case, One Support is the company you are calling, not Microsoft. Another example, support.apple.com is the real Apple support page. TechWizards4u.com/applesupport would something I wouldn't click on. The outlined box in a Google result can sometimes be your best bet, but always still check the web address. We are here to answer any questions you may have. If you get a pop-up, email or phone call you aren't sure about, call us and we can quickly tell you if it's real or a scam. If you want us to help you install an adblocker call or come by. If you are interested in our 24/7 Maintenance Plan that can help filter out malicious links, and gives you access to unlimited remote support from our local staff, let us know.